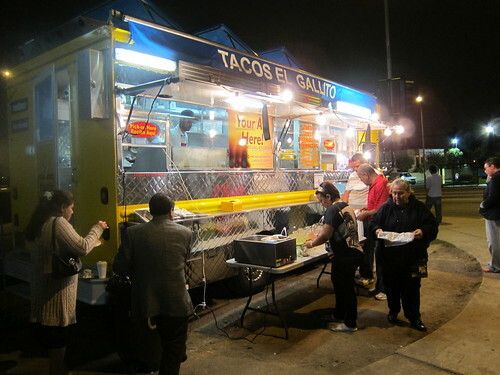 Tacos El Gallito parks at the corner of La Brea and Venice day and night. The first time I went it was daytime. I ordered three tacos and a grape soda. Then I took a few bites of my tacos and wondered what had happened to Tacos El Gallito. The tacos were terrible. The meats were dry and flavorless; the tortillas were wilted; the salsas were bland. I put off blogging about the experience. Weeks passed by and I heard that El Gallito had started cooking carne asada on a charcoal grill at night outside their truck. I figured they deserved a second chance so I went back. 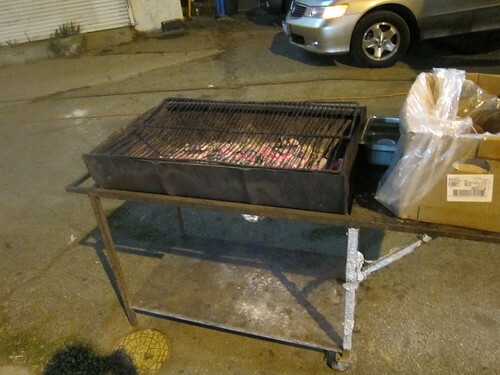 When I arrived they had just pulled the carne asada off the charcoal grill. The meat goes from the grill into a tin container then is taken inside the truck where it is chopped up. It’s a difficult setup but it’s understandable given recent city crackdowns. There was a good size crowd. It wasn’t Taco Leo, which from across the street looked like a small taco riot but there was a steady flow of patrons. 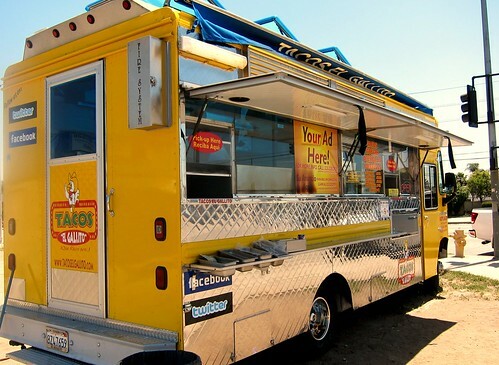 That’s a must when taco trucking at night; all the good trucks have a crowd. 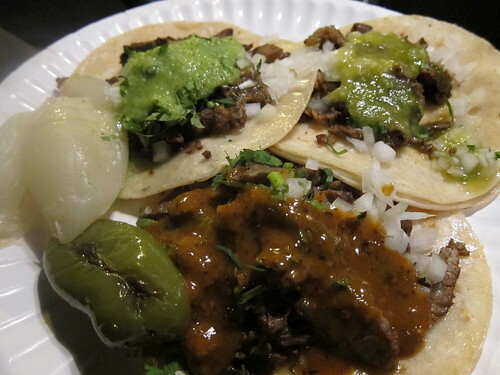 It took awhile to get my carne asada tacos. Ideally you would want that carne chopped up right after coming off the grill then scooped up into corn tortillas then garnished. But these were pretty good anyways and had a nice charcoal taste. The meat was much better than it was during the day; so were the salsas. The salsa bar was stocked with four different salsas: roja, verde, avocado, pico de gallo as well as all the fixins: radishes, onions,cilantro,and limes. El Gallito has been moving westward the last couple years with outposts at La Cienega and Venice, another at La Cienega and Sawyer and recently at Westwood and Santa Monica Blvd. Eventually I’ll get to them all. Must have been hard for you not to go visit Leo's. Or did you!?!?! no, but i was tempted! I don't like Salsa's that are just one solid color. I'll stick with Leo's for that location. You should have a burrito corner! 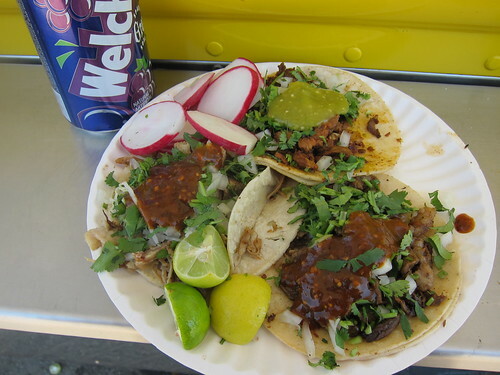 This looks so delicious I love tacos but when it is with fresh roasted meat there is nothing more yummy than it.